Tomorrow is the first of November and countless writers all over the globe know what that means: National Novel Writing Month, or NaNoWriMo. The idea of NaNoWriMo is to write 50,000 words during the 30 days of November. It’s stressful, it’s fun, it’s a great way to meet other writers, and if you’re able to knock out 50K words in 30 days, not only do you get bragging rights, you have the beginning of something amazing: a novel. 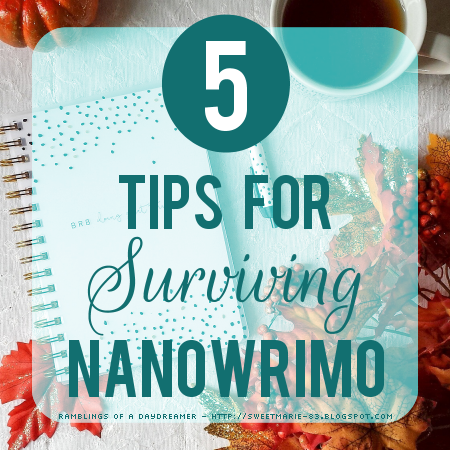 Because NaNoWriMo is an incredible feat that can leave you feeling drained, there are some important things for participants to keep in mind. 1. Plan ahead. During NaNo (and pretty much any other time you’re dealing with writers) you’ll hear a lot about pantsers vs plotters. Whichever you are and whatever works for you is completely fine. If you’re a fly-by-the-seat-of-your-pants type of writer, it’s good to at least have an idea of what you’re going to write and how you want to start. If you sit down on November 1st with no plan whatsoever, you could potentially waste the first few days of the month trying to decide what to write. At that point, you’re already behind. 2. Don’t edit as you go. This is a good rule of thumb any time, but especially during NaNo when time is precious. Just get the words out, even if they’re not pretty. Many long-time authors will tell you their first drafts are always crappy, even after years and years of writing. That’s okay. There’s no shame in it. If you’re constantly going back and fixing things as you write, it’ll take you much longer to finish. If you realize something needs to be fixed or fleshed out, make a note and deal with it during revisions. 3. Take breaks. Breaks are crucial to your physical and mental health. NaNo can be extremely stressful, and some people are harder on themselves than others. Be sure to take time to eat, drink, and get some form of exercise. If you’re stressed or feeling creatively blocked, find some other way to be creative - photography, colouring, painting, knitting, etc. Try not to think of the breaks you take as ‘wasting time’ - it's necessary to recharge and take care of yourself. 5. Don’t be too hard on yourself. Writing 50,000 words in 30 days is hard. It’s mentally draining. Some people are in their element and others flounder or decide it’s too much for them. If you’re overwhelmed or if life simply gets in the way, know it’s okay to slow down or quit if you feel it’s necessary. You’re not in competition with anyone and it’s not the end of the world if you don’t reach 50,000 words. 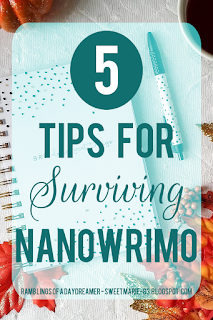 Do you have any other tips for surviving NaNoWriMo? Are you participating this year? Feel free to leave your username or link in the comments. Do you have questions? Let me know in the comments, or feel free to email or tweet me!